Back in April ’06, I wrote a column about getting billed for Clippers tickets that included an extended section about Sam Cassell’s brilliance and all the “little things” he does for a basketball team. I demand that you read it if you’re a Celtics fan. Maybe Sam is at the tail end of his career, but his spirit and personality remain as strong as ever, and I don’t think people back home fully realize how many unique things Sam does during the course of an NBA game, or how much fun they’re going to have watching him play on a game-to-game basis. You can’t overstate how big the Cassell and P.J. Brown signings were for the Celtics; in the span of 48 hours, I went from thinking they were destined for a Round 2 exit in Cleveland to believing they can win the championship if everything falls right. 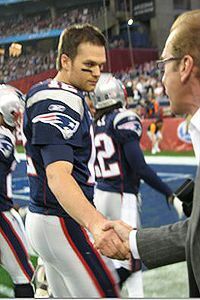 yep, it’s the ominous pregame handshake between Tom Brady and Pat O’Brien! It’s interesting that the celebration on Bourbon Street after Super Bowl XXXVI happened at Pat O’Brien’s (a bar on Bourbon Street), and the downfall of the 19-0 season started with Pat O’Brien. I don’t know what this means. Thanks to Steve Harding for taking the photo and reader Hugh Q. for sending it along. My favorite link of 2008 so far: Two decades of deadline deals on NBA.com. I have to make three points here: First, I had blocked out of my mind that Boston traded Andrew DeClercq and an unprotected No. 1 in 1999 (a pick that ended up being No. 8) for Vitaly Potapenko, then immediately signed him to a $33 million deal. The GM of the team at the time? That’s right, Chris Wallace (NTFNCW). You couldn’t make this stuff up. Second, scroll down to 1990 for the life-altering “Christian Welp for Uwe Blab” deal. Has there ever been a greater and more inexplicable one-for-one swap? I say no. Third, why hasn’t anyone launched a Web site that lists every NBA trade ever and breaks them down by years and teams? Or at the very least, why haven’t our friends at basketball-reference.com done this? Let’s make this happen by the end of 2008. I insist. My favorite newspaper story of 2008 so far: Dave Stewart giving his blistering thoughts on Roger Clemens to the San Francisco Chronicle. Even in 2008, Stewart somehow manages to own Clemens. By the way, check out the graphic on the bottom of that piece with their head-to-head matchups from 1986 to 1993. Yikes. I think I’d blocked that out of my mind. In my post-trade-deadline blog, I wondered why Otis Smith didn’t trump San Antonio’s offer for Kurt Thomas. Well, Florida Today reported Seattle demanded first-rounders in 2008 and 2010 from Orlando, then settled for a 2008 first-rounder from San Antonio that will be a worse pick than the pick Orlando was offering. Um, how is that not collusion? Sam Presti worked for the Spurs; now he’s giving them a discount price for Thomas? Throw in Brent Barry’s curious decision to spurn Phoenix for the Spurs, as well as Steve Kerr’s frustrated comments afterward, and this is like one of those shady incidents that happens in a fantasy league. I thought Presti stopped working for the Spurs? HBO launched its own YouTube channel, a wildly unimpressive effort so far (where are all the “Young Comedians” clips?) except for the long-lost clip of the early-’80s HBO intro for every show and movie. All teenagers from the ’80s should watch this to get flashbacks to the era when they watched this intro praying for the ratings page with “SSC” and “N” to come up right afterward. there’s a new Loser Legacy Kid in town! Do you think they went to the same prep school and banged out a 2.1 GPA while everyone else pretended to like them because they had the best houses for parties? As for Hank’s shots at Red Sox fans, here’s my response: You’re 50 years old! Where have you been for the last 49 years? Is this like when Raymond Babbitt was rescued from Wallbrook? If you ever wondered why everyone in Canada hates Vince Carter, just watch this clip of the “Top 10 Reasons Why Everyone In Canada Hates Vince Carter.” A magnificent piece of work. Did you know that Kenny Mayne is writing a book? Well, Kenny Mayne is writing a book. More suggestions from the readers for sports-related terms named after players: The Trent Tucker Rule (can’t get a shot off with 0.3 seconds or less); Hack-a-Shaq; Jordan Rules, the Hamill Camel; the Cruyff Turn; and the Deion Sanders Rule (you have to take your final fall semester exams to play in your school’s bowl game). Let’s add them to the list that includes the Gordie Howe Hat Trick, Tommy John Surgery, the Fosbury Flop, the Larry Bird Exception, Pesky Pole, The House That Ruth Built, the Roy Williams Horse-Collar Penalty, the Allan Houston Rule, the Mendoza Line, the Doyle Brunson and the Rob Ray Rule. Also, you can throw the Ewing Theory on there if you think it’s well-known enough. Last Friday, I went on Dave Dameshek’s show, and we spent a whole segment (fast-forward to the 15-minute mark) discussing Adam Carolla’s impending appearance on “Dancing with the Stars.” If you had told me this scenario would happen four years ago, I would not have believed it. Did you see this Variety article about the WWE crossing into the movie business? I loved this quote from the head of WWE Films: “There’s a strong audience base that is ready for movies that star our guys.” There is? Then, Vince McMahon chimed in, “The films we’re going to make are fun. Everything we do is about selling fun. We put smiles on people’s faces. Everything we do is about doing that.” Well, except for the Chris Benoit thing. Correction to my solution in Friday’s Sonics piece (the second one) that had a franchise swap with Clay Bennett taking the Grizzlies and moving them to Oklahoma City, then someone else landing the Sonics and keeping them in Seattle: According to Memphis columnist Geoff Calkins, there’s no conceivable way the Grizzlies can bolt before 2014 because of their ironclad lease. Hmmmmmmm. So why hold a fire sale for Pau Gasol then? I’m confused. I’ve got a couch.” By the way, if you’re a college kid in the area and you feel like crashing this event with a “SIMMONS IN 2008! YES WE CAN!” sign, we’ll post any and all pictures on ESPN.com. On Friday, I did a 30-minute interview with Steve “The Homer” True, the host of Milwaukee’s drive-time sports show on ESPN Radio. You’ll admire my long-term strategy, my moxie, my conviction and the way I handled The Homer’s questions about some controversial choices I made in college. As it turned out, The Homer is in the same fantasy baseball league as my old college roommate, Chip, who betrayed me by telling The Homer a few college stories and somehow forgot I was the guy who had the video camera in college. Chipper, we’ll call this an official warning. Slip up again and you’ll become a YouTube star like the “Chocolate Rain” guy. a whopping 115 in all. Come on, we could boost that number, right? People of Milwaukee, IT’S TIME FOR A CHANGE! Speaking of backhanded compliments, New York Magazine blogger Ben Mathis-Lilley took my Mount Rapmore idea and ran with it, but not before calling me “ostensibly a sportswriter who would better be described as the National Commissioner of Bar Arguments” as well as “a notorious Boston homer.” (Actually, what am I saying? Both of those things are true.) I liked his idea that Mount Rapmore should be broken down so that each person fits the slots of the Mount Rushmore people — in other words, one guy should be George Washington, one Thomas Jefferson, one Abe Lincoln and one Teddy Roosevelt — but that means you have to pick one guy for each era (1985-1989, 1990-1993, 1994-1998 and 1998-present), which means it comes down to Rakim vs. Russell Simmons (first era), Dr. Dre (second era), Tupac vs. Biggie (third era) and Eminem vs. Jay-Z (fourth era). The more I’m thinking about it, we might need three Mount Rapmores: one for rappers, one for groups, and one for moguls and executives. Brian G. in Seattle makes a solid point: “I love how you threatened to move to Canada in your second Sonics piece. As you’ll note, this is No. 75 on the excellent ‘Stuff White People Like’ blog.” In my defense, I actually DO want to move to Canada. It’s between Milwaukee, Portland, Austin, Vancouver, Toronto and Montreal for the Simmons family’s next move. We need to get out of L.A. within the next five years before my daughter starts wearing halter tops and miniskirts. For everyone who was amazed by the tidbit in the second “Save the Sonics” piece that David Stern introduced Clay Bennett at the Oklahoma Hall of Fame’s 2007 induction ceremony, here’s Jim Moore’s column about this startling event when it happened in November. If the Seattle-Oklahoma City thing were the JFK assassination, this would be the Oswald-Ruby meeting. This New York Times feature was fascinating: Improbably, Jay Leno is sitting in the catbird’s seat after NBC basically sent him out to pasture three years ago, and incredibly, he has become a sympathetic figure even though he’s about to make $40 million a year. You could write a 500-page book on how badly NBC botched this entire thing. Does anyone really think Conan will succeed at 11:30? And how could the network walk away from a franchise that earns it $100 million in annual profits? I’m convinced you’re given a partial lobotomy as soon as you become a network executive. Uh-oh. My buddy Rob Stone is taking a beating from bowling fanatics for having the audacity to enjoy himself during PBA broadcasts. Is it going to help matters or hurt matters when I join Stoner for a PBA telecast this month as the third guy in the booth? I’m going out on a limb and saying it’ll hurt matters. Oh well. I’d like to nominate this for “Most Depressing Blog Piece of 2008” so far: A crusty L.A. Times blogger crushing David Archuleta after his remarkably good performance of “Imagine” on “American Idol.” I never watched “Idol” before this season and only started watching it because my daughter latched onto the show, so we watched the “Imagine” cover when it happened, and I have to say, it was a moving moment. It really was. Our whole house was transfixed. Have we really reached the point in life where everyone who stands out needs to be torn down, even if it’s a 17-year-old singer? I just thought this was a really depressing piece. Our YouTube Request of the Week, courtesy of Wolfe in Boston: “Given that you are the new champion of calling for new YouTube clips, I was wondering if you could request some vintage Pedro. It’s a travesty that I can’t watch Pedro’s 17-strikeout game in Yankee Stadium every night before bed.” Excellent call. The Yankee Stadium game, the Gerald Williams brawl/almost-perfect game in Tampa, Game 5 of the 1999 ALDS and the ’99 All-Star Game should all be on YouTube. There’s no excuse. Two nights ago, the Sports Gal pay-per-viewed “In the Land of Women” while I was sifting through 3 million e-mails from Seattle, and I ended up getting sucked in. The movie stars Adam Brody, who I once called the next Tom Hanks during the height of “The OC” craze. Not one of my finest moments. (He’s destined to be the star of one of those witty “How I Met Your Mother”-type sitcoms, which isn’t a bad thing at all. But he’s not the next Tom Hanks.) Brody plays an L.A. writer who goes back to Michigan to spend a few weeks with his dying grandmother and ends up getting sucked into the lives of the family across the street. And you know what? This probably could have been a decent indie movie except I was too distracted by Meg Ryan’s face. She plays the mom of the family across the street and was supposed to have a flirty relationship with Brody, only she kinda looks like The Joker now. I couldn’t get past it. This wasn’t like a Priscilla Presley-type, over-the-top plastic surgery where she looked like Catwoman; half the time, she still looks like Meg Ryan, then she’d smile or make a face and turn into The Joker. I couldn’t handle it and kept talking about it every time she had a scene. Finally, the Sports Gal asked me to leave. I have to be honest, I only saw the first half of the movie, but I still can’t recommend it. We’re leaving this vacant this week after printing nearly 23,000 words of “Save the Sonics” content Thursday and Friday. But since Howard Schultz was the guy who started this runaway train by selling the Sonics to a guy who wanted to move them, here’s a link to the Starbucks Gossip blog, which features every unflattering piece of news you’d ever want to know about Starbucks. Enjoy. 2. This Week’s Irresistible Request to Pimp a Goofy-but-Entertaining Web Site or Blog. I’m making the irresistible request this week: So long to our friends from www.straightcashhomey.net, who parted with Page 2 last month but continue to crank out horrendous jersey sightings daily on their site. This remains one of my favorite Internet ideas of the past five years. Come on, check out the Feb. 25 entry of the guy working at his desk in a Curtis Enis jersey. How can you not love this site? Peter Vecsey’s upon-further-review take on the Marion-Shaq trade was interesting. Ryan in Arlington, Va.: “The Hardball Times posted an item where the premise is to find the least value possible for the outfield positions. Ricky in Alexandria, Va.: “Any NBA GM who takes Mike Beasley with the first pick in the NBA draft should be forced to read this article. Yeah, I can see Jordan not working out for an entire year because it was too cold.